Isaiah 48,11 For MY own sake, even for MY own sake will I do it. For how should MY NAME be polluted , and I will not give MY glory to another. When I seek elsewhere for the things that flow from the names of GOD, I give HIS glory to these other things. 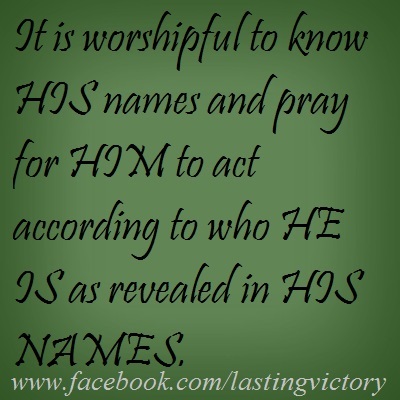 It is worshipful to know HIS names and pray for HIM to act according to who HE IS as revealed in HIS NAMES. This entry was posted in NAMES OF GOD and tagged faith, God, Jesus, NAMES, Names of God, peace, PRAYER, WEAPONS OF WARFARE, WORSHIP. Bookmark the permalink.